Lool Beh Hostal Boutique is a cozy and functional accommodation lodge that capitalized its experience in the sector and its knowledge about the city to offer the guests and travellers the best possible stay. In addition, we are committed to high standards of quality to provide our guests and travellers with a fantastic service. Lool Beh Hostal Boutique Located in San Miguel de Allende, within 2.1 km radius of Church of St. Michael the Archangel and Historic Museum of San Miguel de Allende, offers accommodation in San Miguel de Allende. In addition, other relevant landmarks such as Parque Benito Juarez and Galeria Casa Nomada are as well near to our facilities. Private rooms with shared bathroom, ideal for couples. Shared dormitories with 4 beds, shared bathroom and a private room with 2 double beds, balcony and private bathroom. Free Wi-Fi will be provided in all areas. A continental breakfast is included. 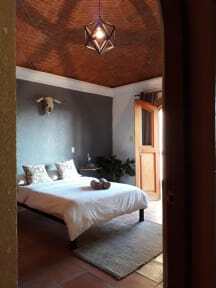 There are shared rooms and double rooms, with shared and private bathroom. There is also a kitchen / dining room, a patio, a balcony, a garden and rooftop, 24-hour reception. The option of camping is also offered.